Contrary to its name the German Rough Haired Pointer is an all-around gundog, not just a pointer. It is capable of pointing, trailing game, flushing and retrieving from both land and water. 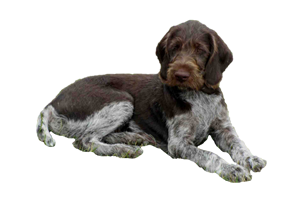 The German Rough Haired Pointer originates in Germany and is closely related to the other German pointers, the Longhaired, Shorthaired and in particular, the Wirehaired. There are two strongly differing views on the history of the breed. The first is that it is the oldest of the rough coated German pointers, a variety of the German partridge dog and not a newly created breed. The second is that it was developed in the 1900s from crosses of other breeds such as the Pointer, English Foxhound, Pudelpointer, German Shepherd Dog and the German Wirehaired Pointer. It may be that there is some truth to both theories, perhaps numbers from the old type had become too few for breeding and other dogs were added to recreate the breed. Today there remains very few registrations for this dog, even in Germany, although it retains its Fédération Cynologique Internationale (FCI) recognition. Is the German Rough Haired Pointer Right for You?